Experience gorgeous sunsets from the top floor of the Shores of Maui, a two story, 50 unit garden style condominium complex. Take in the great ocean view from your lanai, as you listen to waves, and watch the surfers. Relax in my comfortable, affordable condo. I have everything you need for a great stay! Walk one block to Kamaole Beach I, one of the best beaches in sunny south Kihei, for snorkeling, swimming, surfing, and boogie boarding or just relax beside the pool. Enjoy the private tennis court and easy walks to nearby restaurants, shopping, and supermarket. Parking is free. Grab your bathing suit and shorts and come vacation in my fun Kihei condo. The location! There is nothing ever going to be built that can block the oceanview! I love that i can see the ocean from the living areas of the unit. Cooking, doing dishes, eating dinner,, all offer the view! There is a wall unit located in living room. That is the only AC in the entire unit. The building does not allow AC units to be installed in the bedrooms due to the layout of walkways. The coffee maker is a drip coffee maker with a basket style filter. There are coffee filters in the unit. The coffee here is so good! I highly recommend you try it! i have a regular two slice toaster as well as a toaster oven for your use during your visit. basic spices are available for use by all the guests in cupboard. very nice to relax in! We had a great week here. Walking distance to the beach, grocery and restaurants. Wonderful water views and sunsets. Unit was well equipped with beach chairs. Easy to work with the owner. Highly recommend this place. It is a wonderful place to stay. An easy walk to the beach, shopping and restaurants! The condo was in a great location, just a few minutes walk to the restaurants, open air market, grocery store, etc. It had everything we needed for a comfortable stay and a fun day at the beach. The view from the lanai was amazing at sunset, and it was fun watching the surfers and paddle boarders early in the morning. I would stay here again for sure! Three of us stayed here during January and enjoyed our stay immensely. Everything was just as described. The location was perfect, walking distance to a great beach, directly across the street from an ideal launching spot for paddle boards and beginner surfing....with several places to rent boards within a block. Many restaurants and shopping all within walking distance. The ocean view from the unit was amazing. And communication with the owner and his manager was terrific. The unit was stocked with everything you need for cooking, as well as beach chairs, boogie boards, snorkels, fins, etc. etc. And even without the A/C in the bedroom, we were fine with the fans provided in the unit. Perfect location and amazing view! My husband and I and our two kids had an amazing stay here! The condo was very clean, was fully stocked with everything we could need and there was lots of room for the four of us. The condo had all the beach equipment we could want as well (beach chairs, sand toys, umbrella, boogie boards, coolers, etc). Sue went above and beyond to make sure we enjoyed ourselves while in Kihei. Thank you Sue! The view from the lanai was beyond remarkable! We spent hours sitting on the lanai watching the surfers, listening to the waves and soaking in the sights. The sunsets were incredible and we had a front row seat every evening! The kids enjoyed the pool and even tried their hand a tennis. The condo is within easy walking distance to Henry Young Beach as well as Kamaole Beaches I and II. The beach across the street, Cove Park, is great for surfing and boogie boarding. We took surf lessons from Maui Wave Riders which is on the corner and we were all surprised that we could get up and surf. After that, we spent a number of days surfing and paddle boarding. We would definitely come back and stay here again. 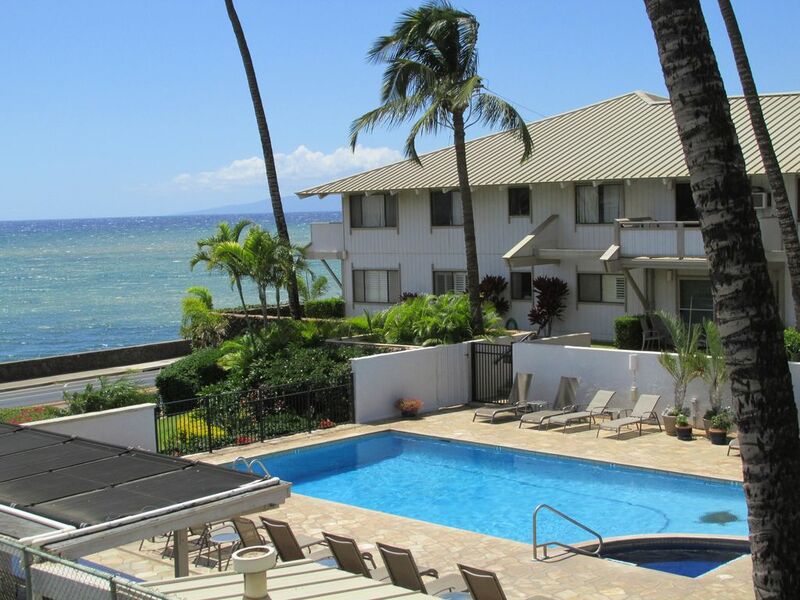 We highly recommend this condo to those wanting to visit Kihei. I had such a great experience with this place! Check in and out was super easy. We got to check in a little early even! Nice clean place. Really good view and convenient area to walk around the beach park across the street, food trucks, & shopping. We were there during the tropical storm warning and Sue was really great about reaching out to us to make sure we were prepared and let us know she was close by if we needed anything. I would definitely stay here again! You can't beat the price for what you get. Payment via check in USD is preferred. If you would like to make your reservation, please send the 50% down payment, please email me for my mailing address. Cancel Policy: During High Season Dec 15-April 15 there is a 10% rebooking fee on all cancellations. If reservation is cancelled less than 30 days prior to arrival refund is available if we are able to re-rent the unit. Mahalo! !